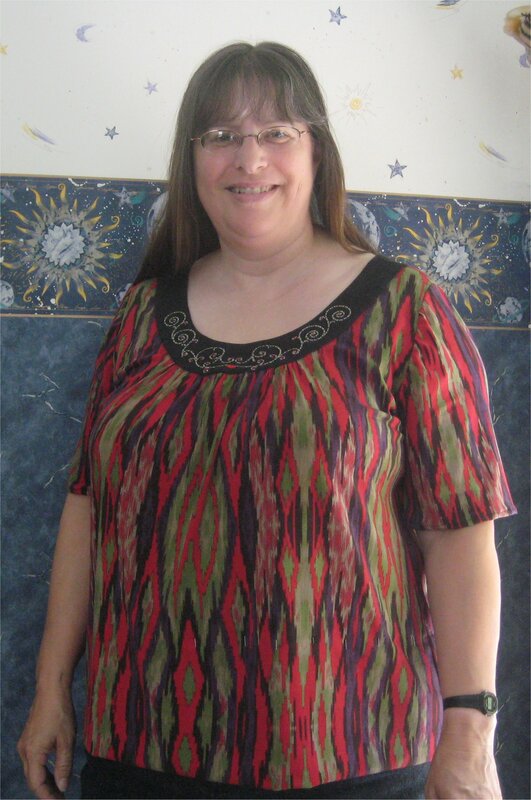 This is pattern Butterick B5219. It's made from jersey knit, a very fluid and drapey knit. Feels very heavy in the hand but not while wearing it. Because the neckband is a solid fabric, I decided to embellish it with machine embroidering. I combined three designs to make the final design. The center design is from The Embroider's Eye at http://www.embroiderseye.com . Althought it was a freebie at the time I downloaded it, I can't find it now on the website. I have an email to Ramon (the owner/digitizer) to see if he can identify it for me. I mirror-imaged the design to get a complete design. I noted that the line under the scroll didn't quite meet at the center, so I isolated a very nice small heart from A Stitch A Half scroll border design and plopped it on top the gap between the Embroiderer's Eye design. The far left and right scrolls were freebies from Creative Machine Embroidery magazine. I mirror-imaged the scroll so that I had the motif oriented in the correct direction with respect to the center scroll design. This specific freebie is no longer offered. The Creative Machine Embroidery scrolls where done first, then the Embroiderer's Eye design. 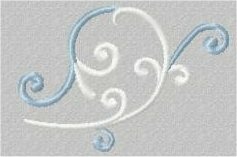 This was so the Embroiderer's Eye stitching would overlap the end of the Creative Machine Embroidery scrolls. The heart from A Stitch A Half was done last, so it would overlap the ends of the Embroiderer's Eye line and cover the gap between them. The colors in the jersey knit are black, dark purple, Christmas red and olive green, although it seems as though the red is predominate. 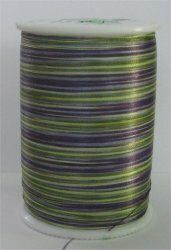 I used Signature Pixels trilobal polyester embroidery thread (size 30) in a variegated purple, light & dark olive green .. the color is called "Eggplant". It coordinated wonderfully with the colors in the fabric. To tie in the red, I did the heart in red trilobal polyester. And then so the red heart wouldn't stand out so much, I sewed some metallic red seed beads in curve of most of the scrolls. These small red bits tied everything together very nicely. All of the designs were freebies and I must say the stitch-out was fantastic. Generally speaking, freebies are a gamble ... you never quite know what the quality is going to be like. But the ones from the above digitizers are great; I wouldn't hesitate at all in recommending them. The pattern went together very nicely; the directions are good. The sleeves in the pattern are either cap sleeves or 3/4's length .. neither of which I like. To get the above-elbow length sleeves, I simply shorted the 3/4's length sleeve. The neckband fits wonderfully ... it lies flat on my chest with absolutely no gapage at the center front. I am very pleased with the way this feature turned out.